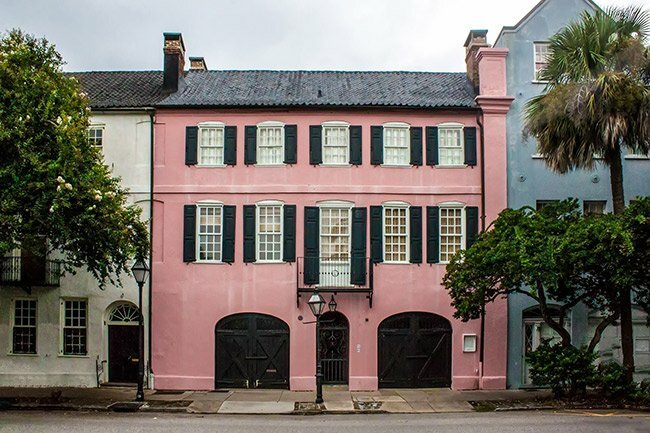 In 1931, Judge Lionel Legge and his wife, Dorothy Porcher Legge, purchased a house at 99-101 East Bay Street in Charleston and painted it a pastel pink. 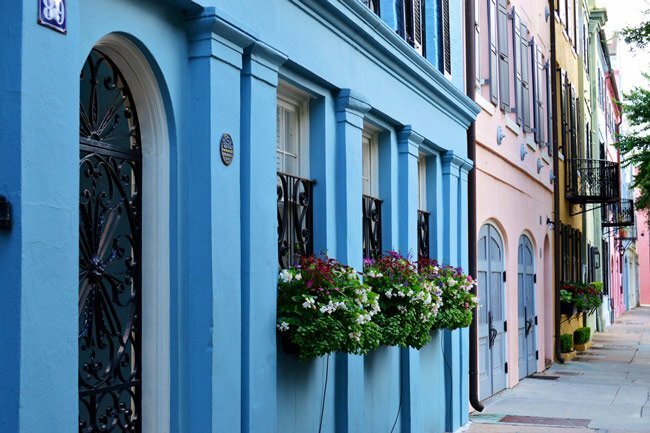 Neighboring owners followed their lead, and soon a “rainbow” of soft hues emerged, lending these historic townhomes the name for which they are now famous – Rainbow Row. As charming as these homes are now, such was not always the case. Facing the Cooper River, many of the buildings served as stores situated along the wharves with living quarters above. Following the Civil War, they were left to fall into disrepair. 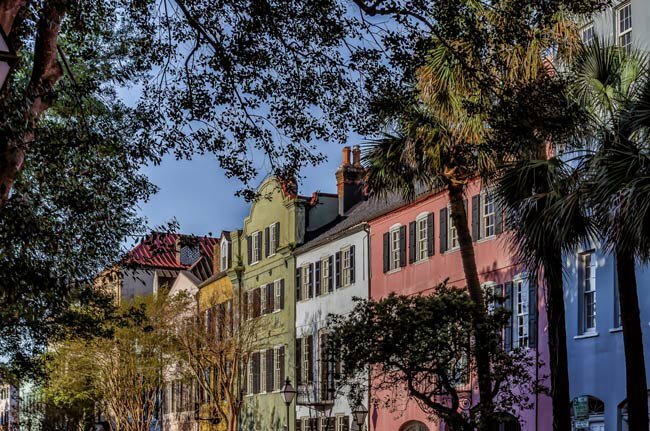 During the 1920s, Susan Pringle Frost, who formed what is now known as the Preservation Society of Charleston, bought six buildings for the sake of restoring them. Though she was financially unable to renovate the buildings at that time, the Legges stepped in and began the process a few years later. 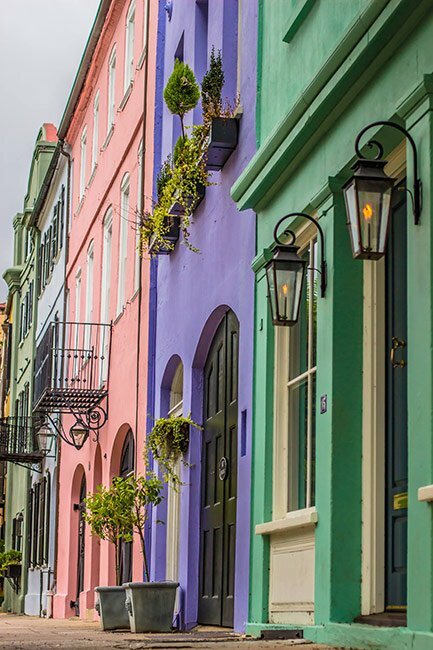 It has been suggested by some locals that the houses were painted in the various pastel colors so that intoxicated sailors coming in from the port could remember which houses were their own. Another legend claims that these buildings belonged to merchants and were painted various colors to indicate what goods were sold in which buildings. 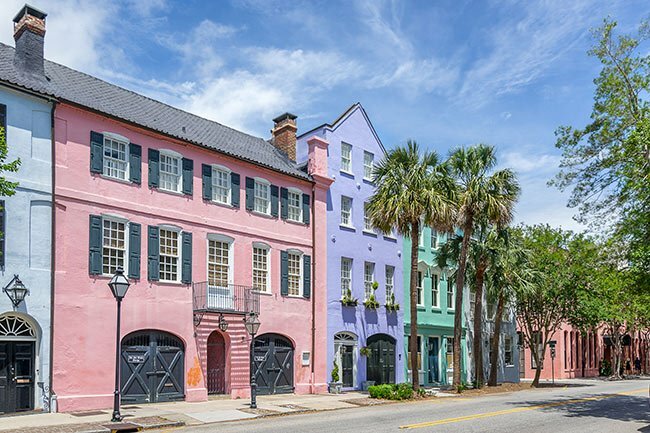 Though many myths persist regarding the vibrant colors that adorn these buildings, those strolling down East Bay Street can simply thank Dorothy Legge for her lively taste in exterior paint. The Lowcountry region of South Carolina typically has mild winters but during January of 2018, residents and visitors alike were surprised with a blanket of white snow in the Charleston area. When snow does occur, it is usually melted within a day, but this particular snowfall lasted nearly a week sending excited onlookers out to photograph as many scenes as they could. 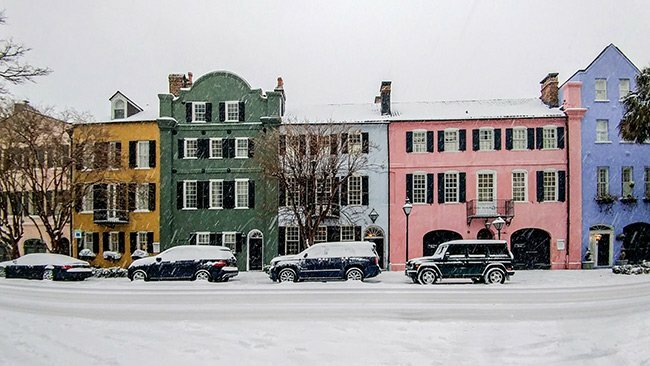 The photo below depicts Rainbow Row during the 2018 snowfall. The Othniel Beale House – named for Colonel Othniel Beale, originally of Marlbehead, Massachusetts – is thought to be the oldest intact home on Rainbow Row. It was also the first to be restored when the Legges began work in 1931. Beale was a wealthy wharf owner who built four structures here, comprising numbers 95-101 East Bay Street, across from his wharf. Each of the four structures served as a tenement with retail space on the ground level. The home pictured below, located at 99-101 East Bay Street, was Beale’s primary residence. 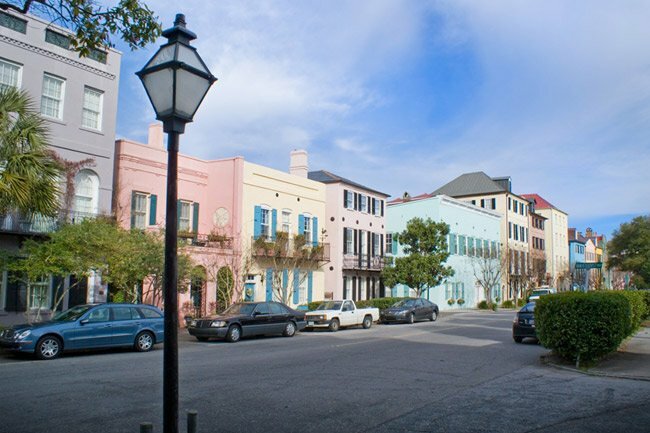 I don’t know anything other than the Arthur Ravenel, Jr. Bridge that says “Charleston Living” more than Rainbow Row on East Bay Street! Early mornings are crowded with local joggers and tourists alike from Waterfront Park all the way to the Battery. The cars lining the street in the million-dollar residential area required that I climb up on a brick wall in order to capture this shot on a Sunday morning and avoid the cars and all the foot traffic. 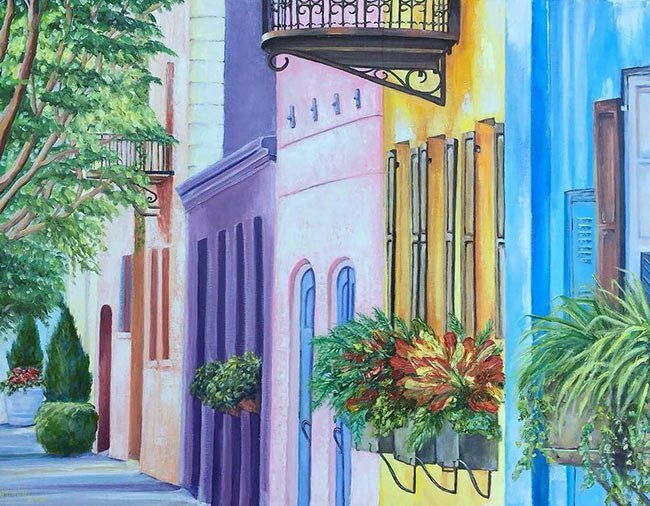 The painting below, by artist Diane Minuni, reflects the new face of these traditional row houses as colors change for a new generation of owners. THAT pic I must have!!!!!!! I have a painting of this in my livingroom. A friend gave it to me. It’s very beautiful! I went on a carrage ride there! Beautiful street! If you ever get to South Carolina this is a must see — along with the many other sites nearby and the market!